Lot Detail - He Sank The First German Submarine of World War One. He Sank The First German Submarine of World War One. 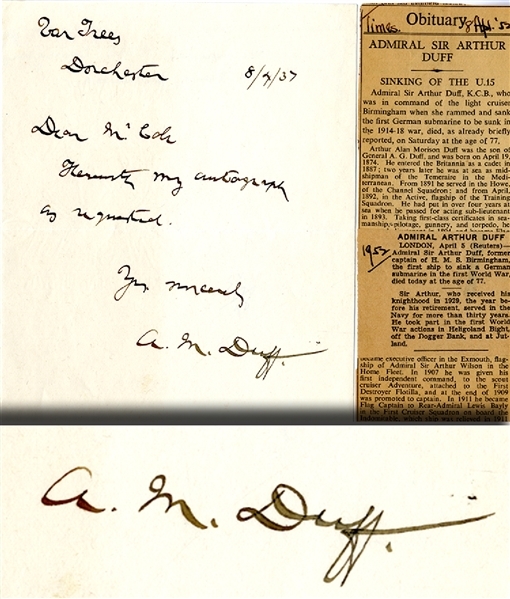 Arthur Duff, British admiral, Captain of H. M. S. Birmingham at the battles of Heligoland Bight, Dogger Bank and Jutland. Duff sank the first German Submarine in World War !, U-15, ramming it with his vessel and sending it to the bottom with all hands remaining onboard. Scarce A. L. S., 1p. 8vo., Dorchester, Apr. 8, 1937 sending his autograph to an admirer. Fine, with clippings of his obituary.